Picking out baby boy gifts and toys is not only fun, but also helps your baby and his development. At each age, toys can encourage your child to reach important developmental milestones. During the first three months, your baby isn’t really able to do more than just observe the world around them. Their eyes have not developed fully and they their vision is still blurry. Black and white used to be the favorite toys for this age, but now choosing toys that have strong colors and bold patterns will also help to stimulate your baby’s sense of sight. As your baby boy grows, toys will start to stimulate the other senses. Toys that crinkle will promote the sense of hearing and a toy that is nubby or plush will help develop the sense of touch. Toys that are encouraged for this age are rattles, baby-proof mirrors, and floor mats or gyms. Developing motor skills are also very important at this stage. Play mats that encourage tummy time help build muscles in the head and shoulders. Walkers and balance bikes can aid in learning to walk by building core and leg muscles but also provide stability needed to take those first steps. These activities fall into the category of gross motor skills. Around your baby’s first birthday they begin to learn about cause and effect. Pressing a button to make a sound or push a toy and see it move helps learn these new skills. Many toys that fall into this category would have a button that lights up and says the name of a shape, color or the alphabet. Your baby is too young to be able to recite the alphabet, but they are still being exposed to language. At this age, it isn’t as much about teaching your baby but more about interacting with them. The following baby boy gifts and toys would make great choices for your young baby, or a great gift for a baby shower. This list promotes the important milestone and checks the developmental boxes your child needs for healthy growth. By encouraging the large and fine motor skills, the senses and language you are giving your baby the best chance at learning and growing into strong toddlers and curious children. 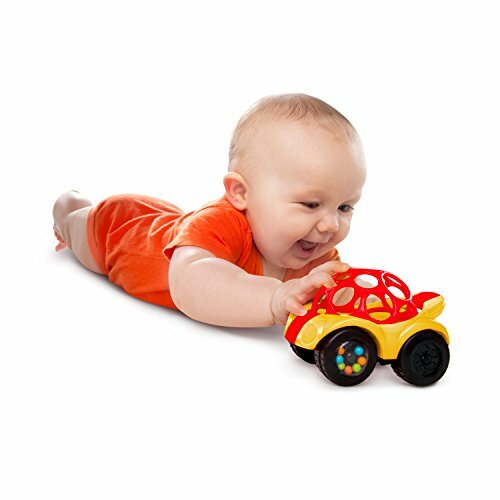 The OBall Rattle & Roll Car by Kids II is a great first car for your baby boy or toddler. The car features large holes that make it an easy toy to grasp onto for your infant’s little fingers. The top of the car is BPA-Free and is flexible and soft enough to be used as a teether. The bottom is made of a durable plastic. As your baby grows they will love the rattle beads inside the wheels when they are the driver and are busy pushing the car around while working their large motor skills. The age range is 3 months old and up. No batteries are necessary as this toy is kid powered. 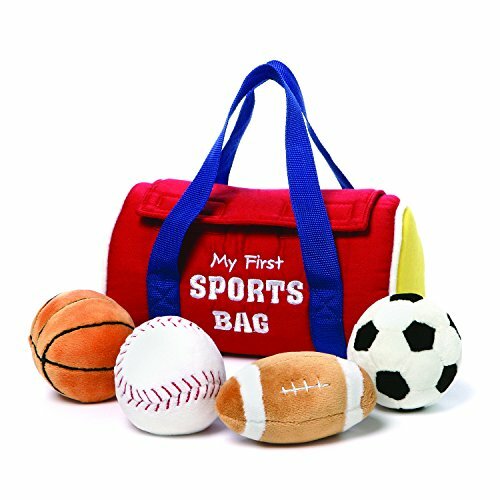 This adorable set of sport themed balls is a great set of sensory toys for your baby boy. Each ball is made of soft plush material and they each make a different sound effect. The basketball squeaks, the soccer ball makes a crinkly noise, the football rattles, and the baseball sounds like a bat hitting the ball and the crowd cheering. Included in the set is also a My First Sports Bag to store the balls in. The bag is 8 inches and the 4 balls are small enough to fit inside. This set is made by Gund and is best for ages 1 and up and is a great way to introduce sports and active play. Wrap this up with a team jersey and it would make a great shower gift for a sports fan. This adorable and happy little puppy by VTech is full of interactive fun for babies and toddlers. The music and lights will grab your child’s attention. Pushing the toy will help build gross motor skills and will make the dog’s legs move, the keys in its mouth swing and the cute puppy’s nose light up. Twisting the tail and the ears work fine motor skills while making the puppy look silly and happy. The buttons introduce numbers, colors, parts of the body and make puppy sounds. This toy made of hard plastic and is suited for ages 3 months to 3 years. This toy requires two AAA batteries for the sounds and lights. There is also a sound control switch near the tail that will help save the batteries. Tummy time is important for babies but many babies don’t enjoy it because it is a different position then they are used to. Not only does it It helps to build important muscles but it also helps the back of their heads from developing flat spots. This Tummy Time Prop & Playmat by Bright Starts is a wonderful way for your infant to enjoy this playtime. 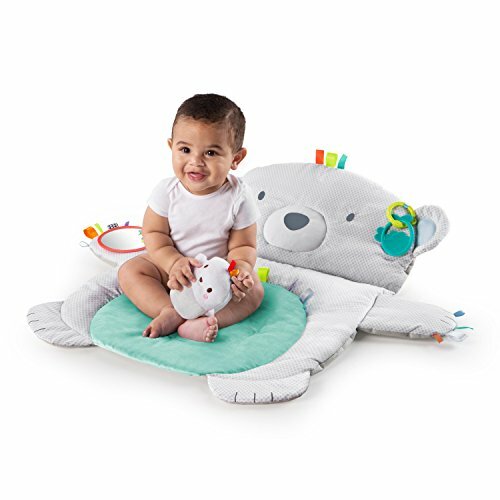 The mat is shaped like a bear and is tented to make it easier for babies to see and to grab the toys, there is a pillow prop and the plush mat will give them support and comfort during play time. The toys that are attached are a baby safe mirror, easy to grasp teether, crinkle sounds, a rattle, and other toy attachments. The head and paws have many little satin loops for tactile play. The mat is machine washable which every mother will appreciate. 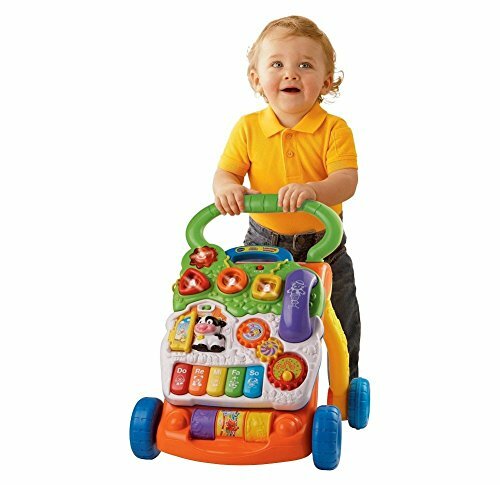 This VTech Sit-to-Stand Learning Walker is designed to grow with your child. The learning center has 5 piano keys that play music, three shape sorters, and two colorful spinning rollers. There is a pretend telephone and a door that opens and closes. The various buttons play over 70 songs, sound effects, and says phrases. 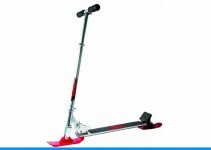 The toy can be used to help your child walk with wheels that can work on carpet and hardwood floors. The wheels also have a speed control switch to adjust it for those who are just starting to stand and adjust it for those who are almost running. Once they have mastered walking the play panel can be removed and set on the floor. This toy checks all of the development boxes. It encourages role-play, gross and fine motor skills and musical creativity. 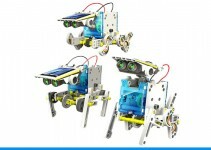 This is designed for ages 9 months to 3 years old and requires two AA batteries that are included. The Tummy Time Discovery Pillow by VTech provides adorable and comfortable support for your baby. 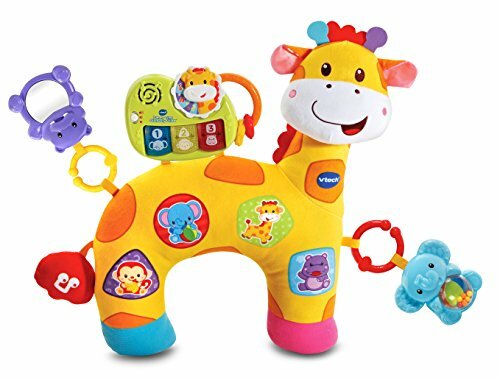 This U shaped plush pillow is in the shape of a giraffe and can be used while they lay on their tummies to build a strong neck and shoulders, it can also be placed around their waist to help give them stability while they learn to sit on their own and then it can be a great toy to take when you are on the go since all of the toys attach to it. The pillow has multiple textures and patterns for tactile learning. There is a baby-safe mirror, rattle, and light up piano keys that play short tunes but also teach shapes, animals, and colors. 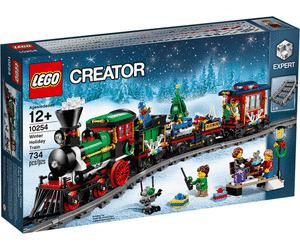 The age range for this is birth to 24 months and it requires two AA batteries that are included. This teether by Manhattan Toy has won multiple newborn toys awards, including the Hot Diggity award, the Oppenheimer Toy Portfolio award and was a finalist in the ASTRA Best Toys award. 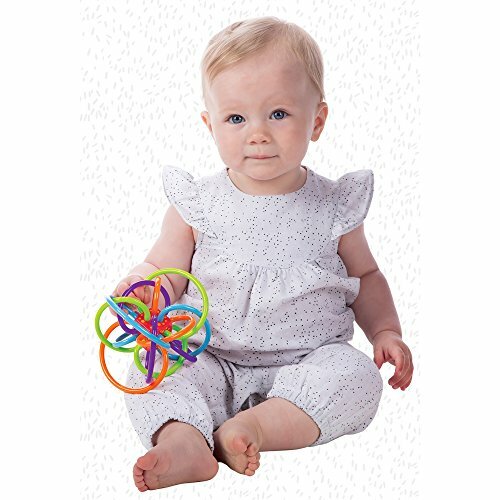 The Winkel Rattle and Sensory Teether Toy is made with soft and safe polyurethane tubes that are perfect for teething. 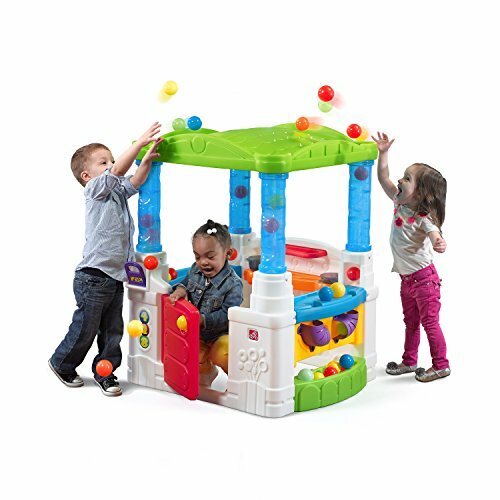 All of the tubes connect into a maze in the middle of the toy with a cube that has a quiet rattle sound so your baby can explore cause and effect of sounds, but not drive you crazy as the parent or caregiver. This toy is very lightweight and promotes two-handed play encouraging gross motor skills. It is made of BPA free plastic. This is suitable for ages 0 – 24 months and can even be put in the refrigerator to help relieve sore and swollen gums when teething. Just make sure to only wash the surface of the toy and not submerge it under water. 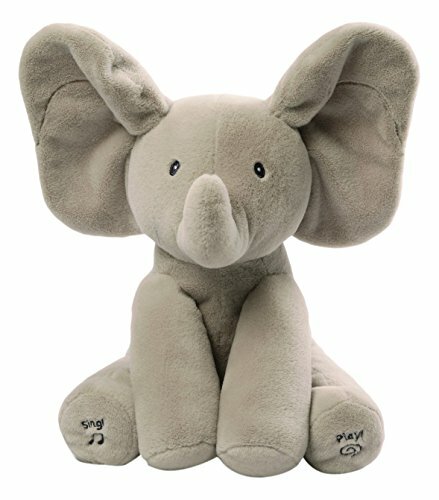 Meet the adorable and award-winning, Flappy the Elephant plush toy by Gund. This soft elephant has two different modes of play. One mode is peek-a-boo and the other mode it sings “Do Your Ears Hang Low” for interactive play with babies and young children. Press his foot and while he sings his ears move up and down. Press his other foot and he covers his eyes with his large flappy ears and plays peek-a-boo. The elephant is also soft and cuddly making it a perfect companion. This would be a great shower gift for a new baby and it is gray and gender neutral. The toy measures 12 inches and needs three AAA batteries that are included. The VTech Rhyme and Discover Book is recommended for ages 6 months to 3 years old. There are six pages of interactive fun that read and sing stories. The book has easy to turn pages that encourage thinking, learning and playing. There are seven nursery rhymes, twenty different songs, and phrases and four movable pieces. The book has light-up character buttons. All the pieces are attached and free of BPA so it is a great teething toy and safe for them to have since there is not a choking hazard. The book is small enough for a diaper bag and will keep your baby entertained. Parents will love that it has an automatic shut off and an adjustable volume control. The toy needs two AAA batteries that are included and it is suggested for babies 12 to 18 months old. This Baby Balance Bike by Besource will help your baby boy learn to walk and balance. This is a no pedal toddler trike but can be used by children as young as 10 months old. The bike will teach large motor skills like balance, steering and coordination skills they will need to walk and eventually need to be able to ride a bike. The bike is lightweight and sturdy. 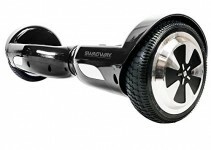 It is made with a steel frame and EVA wheels that are fully enclosed so no toes or fingers will get caught or pinched. The balance bike is very easy to put together with just three steps and one bolt. It weighs about 3 pounds, is 14 inches tall and can hold up to 55 pounds.